Charito Elcano turned 60 this year, a milestone in a life fraught with ups and downs, challenges and opportunities and – in her case – tragedy. A tragedy that took the life of her brother and son and made her a fierce advocate for non-mercury small-scale gold mining. Charito yearns for the old days when they used a traditional method using local grass to extract gold and is keen to have a mercury-free gold processing facility in or near her community of Luklukan Sur, in the lush seaside province of Camarines Norte in the Philippines. While some miners remain sceptical of the dangers of mercury use, Charito says awareness is building. BAN Toxics is UN Environment’s partner in the Philippines for the Global Environment Facility-backed Global Opportunities for Long-Term Development of the Artisanal and Small-Scale Gold Mining Sector programme – or GEF GOLD. The programme aims to reduce the use of mercury in artisanal gold mining and introduce and facilitate access to mercury-free extraction methods, while also working with governments to formalize the sector, promoting miners rights, safety and their access to markets. The artisanal and small-scale gold mining sector accounts for 20 per cent of the world's annual gold production – but it is also the single largest source of man-made mercury emissions globally. Around the world, some 12-15 million people work in the sector – including 4.5 million women and over 600,000 children. 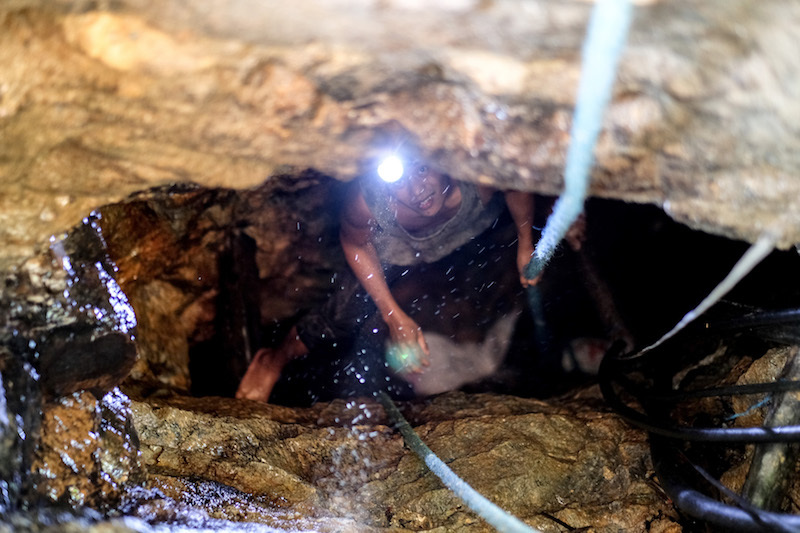 In the Philippines, artisanal mining takes place in more than half of the country’s provinces, supporting more than 2 million people and producing 80 per cent of the nation’s gold supply each year. Mercury is often used in artisanal and small-scale gold mining to separate gold from sediments or ore using rudimentary processing methods. The use of mercury can lead to serious neurological and health issues for miners – especially for pregnant women and children. A 2006 UN study found mercury levels as high as 50 times the World Health Organization level for safe exposure among surveyed gold miners in the Philippines. A native of Luklukan Sur, where mining has been a mainstay for generations, Charito left her village for a career in the textile industry when she was young. But after years of regularly uprooting her family to follow work, in 1989 she decided it was time to return home. And – as for so many of her neighbours – for Charito and her family, returning home meant mining. Charito was one of the lucky ones, and after funding a dig on her family’s land, in 1990 she struck gold – a full 8 kgs of it [$320,000 at current market rates]. Afraid that word would get out and they would be robbed or extorted out of their find, Charito and her team decided to process the gold at home. Her memory of that evening is vivid. Charito rushed her then nine-year-old son and her brother to the hospital, where they were hospitalized for three days. Her brother died on the second day. Her son passed on 15 years later from complications related to his mercury poisoning. Her family tragedy drove Charito away from mining, but with few other opportunities in the province, within a few years she financed a new dig – although this time, she knew the dangers the lure of quick riches brought with them. Today, Charito is a peer educator on mercury risks, as well as the President of the Women Miners Association in Luklukan Sur. With 28 members, the Association was registered in October 2017 and aims to help women and family members of ‘players’ – parties who have a share in a mine – to understand and manage the risks of their trade. “Women in mining suffer. They have to budget what their husbands give them and find other sources of income. Our members mostly work as cooks at mine sites. They also gather waste in mining sites and look for gold from among the waste,” she says. With the bulk of mineral exploration rights in Camarines Norte held by just a handful of companies, even miners who own their own land still struggle for the right to exploit the riches that lie underneath it. Without permits, they operate outside the law, risking heavy fines and even jail time as they struggle to feed their families by pursuing the only the business they know. Charito says that when the authorities do crack down on miners, the cost of release is often as high as 25,000 pesos (more than $1,300) per head – a hefty sum for most miners, who often subsist on as little as $3-$7 a day. While Charito has applied for permits for her mining site, the complicated processes involved and a lack of national-level support for the rights of artisanal miners mean the outcome is far from certain. Charito says she tries not to use mercury in her operations, but looks forward to mercury-free facilities and alternatives that she and her community can use. She is adamant that while they wait and even if she meets with resistance, she will continue to educate her peers on the dangers of mercury use and champion stopping its use. She knows the harm it can do. She has first hand experience of it.